Tony Gahan is a singer songwriter from county Tipperary, Ireland. He was born in Kylotlea beneath the foot of the famed Slievenamon Mountain (Irish: Sliabh na mBan, “mountain of the women”). Slievenamon is a mountain of history and mystery of lore and legends. Its name means the ‘Mountain of the Women’ and the story is told how all the fairest women raced to the top to claim the hand of the warrior, Fionn Mac Cumhail. Fionn secretly fancied Grainne, the daughter of the High King of Ireland, so he advised her how to win the race! He grew up surrounded by Irish music, including that of his uncle Joe. Other influence in his formative years were Shane MacGowan, Christy Moore, Paul Brady, the Clancy Brothers, the Dubliners, the Wolfetones, and Christy Hennessey. Tony emigrated to the United States in 1998 where he found his home away from home outside of Boston, in Worcester, Massachusetts. He has played in a few Irish folk bands based out of central Massachusetts. Now living in Sutton, Ma he is writing more original songs and having fun playing solo. Tony is available for house parties, functions, and pub shows in Massachusetts and Rhode Island. Tony has an extensive catalogue of songs ranging from traditional ballads to more contemporary Irish hits. 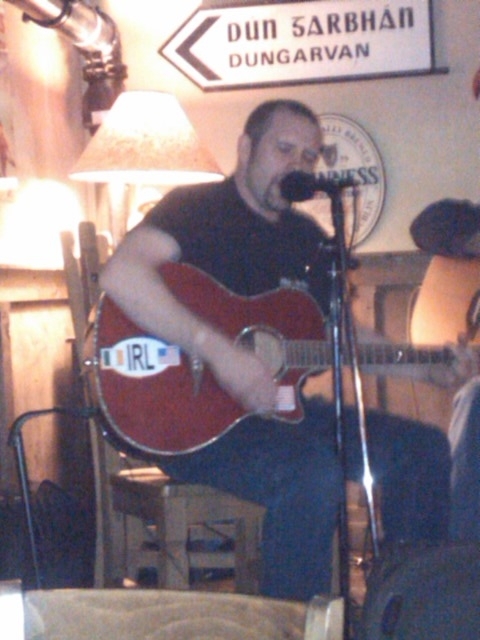 His passion for Irish music shows through in his performances, as every song he sings tell a story.